I know what you are thinking. Disneyland is the Happiest Place on Earth, right? Well, that is the claim but now I question that after going to Children’s Fairyland in Oakland, CA. (check out their site here) For 4 hours, I watched my kids 6 and under run around touch everything and not have to wait in a line longer than 2 minutes. This experience definitely made me happy and my 3 kids, ages 3 and 6 had a great time. This was our second visit to Fairyland. Our first visit was cut very short after we showed up and within 15 minutes of being there it started raining, so we left shortly after. This second time, we were invited to a little girl 4th birthday party. The kids all loved it. Fairyland, unlike Disneyland, ONLY has rides for 54 inches and under. There are very few rides at Fairyland and kids over the age of 8 would probably die of boredom. This park is really made for younger children. Children’s Fairyland was designed in 1948 (opened 1950) to feature children’s favorite fairy tales from books.The park is located right near Lake Merritt in Oakland, California. Fairyland’s goal is to be a magical fantasy world for children. To learn more about the park, check out all the details here. So, here are my top 10 reasons as to why Children’s Fairyland makes me so happy….. So, I think last time I went to Disneyland, tickets were like $95 for kids and $98 for adults. Quite an expense for a family of 5. Spending only $50 to get into the park is way more affordable and doesn’t require a lot of budgeting and saving. #2 You can bring food into the park! Children’s Fairyland has its own picnic area inside the park and they allow you to bring in any outside food or drink. They do serve food at the park but it is nice to bring in food from home or that you picked up outside of the park. Especially, since most amusement park food isn’t the greatest. Please note, I’ve never had the food at Fairyland, but I have eaten at other amusement parks and the food is usually not worth the high cost. #3 Kids can touch everything! With my 3-year-old boys, I usually am screaming, “Don’t touch that!” everywhere we go. This was not the case at Fairyland. I only told them a couple of times to not climb up on a few things. The entire amusement park is setup to allow kids to run in and out of little houses and play areas. #4 There are, like, no lines! There are a few rides at Fairyland. There are two carousels, one for kids over 36 inches and one for kids under. A Ferris wheel, a train, and some slides. The train that takes you around the park has the longest wait time, but for the most part, there are very little lines. Kids are on rides within 2 minutes and this was on a weekend in the summer. Last time I was at Disneyland, we waited 40 minutes to get on Dumbo, yes Dumbo! Standing in long lines with toddlers who can’t hold still is quite hard. While at Fairyland we saw ponies, goats, rabbits, ducks, sheep, chicken, and guinea pigs. Right outside of Fairyland is Lake Merritt. It’s a beautiful place to have a picnic and there are large ducks and birds walking around. After we left Fairyland we took the kids to the lake to do the additional exploring. For only $3 you can buy a “secret key” that can use at different locations in the park. You insert the key and turn it and you get to learn about the different fairy tales in English or Spanish. My 6-year-old daughter loved this part. You only have to buy the key one time. Every time you visit you can use the same key to explore the park with. Unlike Disneyland and other amusement parks, there are no stores, carts, and stands of stuff for kids to see everywhere. We were able to avoid all gift shops and not once did my kids even see anything to buy. I didn’t have to spend $15 on mouse ears for my daughter that she will only wear once before losing. The only ride my 3-year-old boys (36 inches) couldn’t get on was the big kid merry go round. However, the little kid merry go round was only a short walk away. Other than that all my kids could go down slides and on rides together. Now for all of the rides the limit is 54 inches. So, this theme park is not made for older kids. All ages can ride the train. There is so much learning to do at Fairyland. One of Fairyland’s goals stated on their website is for kids to learn through playing and exploration. There are story times on Fridays, puppet shows, magic shows, stories about fairy tales, etc. The four pillars are literacy, science, social/emotional, and creativity. #10 There is a sand pit! Fairyland has two sand pits. One right next to a slide AND they have a sand pit next to a boat for the kids to play on. My kids love playing in the sand! The kids can play and you can sit down and watch. #11 They serve good coffee! I know I said there was 10 reasons, but this park is too good. Both visits to the park we were able to buy coffee. Not just regular coffee, but lattes and iced coffee. The last visit my husband bought an almond joy flavored coffee. It’s very nice to sit around watching your kids go on a ride while sipping on some delicious coffee. Now, I know what your thinking Disneyland can’t compare to Children’s Fairyland. You’re right! Disneyland is a Magical Kingdom with tons of rides, amazing parades, firework shows, restaurants, and characters. Also, Fairyland is really only enjoyable for little kids. However, how free are your children to run around and explore at Disneyland? My kids found the only area that you can run around in, Mickey’s Toontown quite boring. My kids do enjoy Disneyland but last time we were there, there was a lot of complaining about all the long lines, crowds, and walking around. The only complaints I heard at Children’s Fairyland was when we were leaving and they wanted to stay. I am thankful for Children’s Fairyland in Oakland. It provides a fun free play place for my little ones to run around and explore. A couple other notes, parking isn’t free and the parking lot is just “okay”. We parked on the streets. All street parking is free in Oakland on Sundays. Your kids probably won’t need a stroller unless they are under 18 months or they may tire and want a nap. 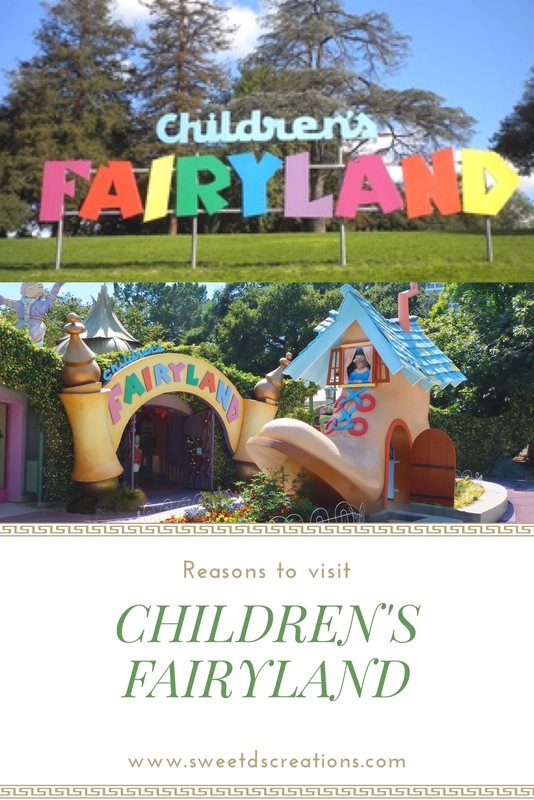 Do you enjoy Children’s Fairyland? Are there other kid friendly places that you like outside of big amusement parks? My kids also, love a place called Jumpity Bumpity (an indoor playground) in Hayward, CA. I’ll have to share details behind that in another post. Of course, if you want to stay home and play, check out my ideas on how to turn your backyard into a party. The image was taken from the http://fairyland.org/ website. Ok I’ve never heard of this and now I need to go. 3 and 1 year old. Thank you! Yes. A must visit when you’re in Northern California. Have never heard of it. Would share it with few friends who live in California. Looks like you and your kids had great fun. Thanks for sharing this wonderful post. I absolutely HAVE TO take my kids here! If it weren’t for this post I would have never found out about this magical place! Me being obsessed with faeries, I’m INTRIGIED!